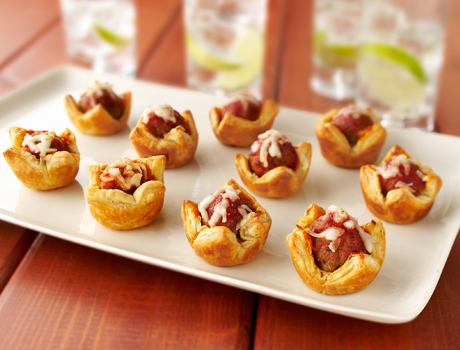 Meatball Parmesan goes upscale when it's served in individual puff pastry tarts. They're easy to make and really delicious. Heat the oven to 400°F. Unfold the pastry sheet on a lightly floured surface. Roll the pastry sheet into a 10 x15-inch rectangle. Cut the rectangle into 24 (2 1/2-inch) squares. Press the pastry squares into 24 (1 3/4-inch) mini muffin-pan cups. Bake for 15 minutes or until the pastries are golden brown. 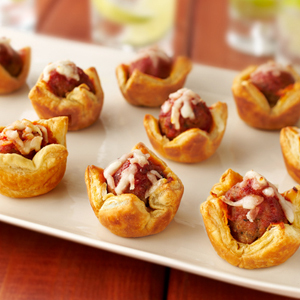 Press 1 meatball half into each tartlet shell. Top each with 1 teaspoon sauce and 1 teaspoon cheese.